TeChef BBQ Grill Pan (SamGyupSal Pan) is very popular cooking appliance in Korea that is used to grill Pork Belly (Bacon), Galbi, steak or any type of meats and fishes. It's a wonderful and fun way to have a BBQ party. 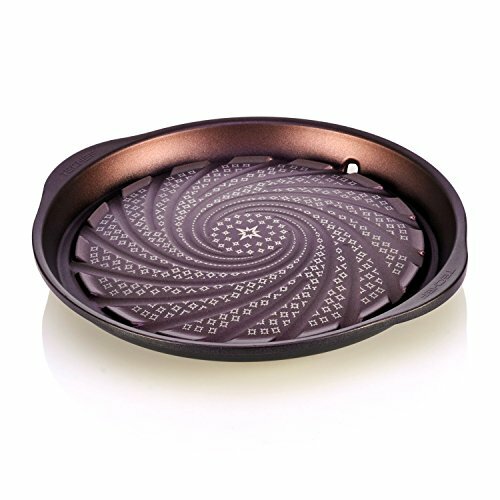 This Korean BBQ Plate can be placed on stove tops or on portable burners and most have well-built draining system to collect excess grease and fat, minimizing oil splashing while grilling. They are very affordable and easy to clean for long lasting care and usage. TeChef cookware includes a non-stick coating and is based on platinum grade Teflon technology without PFOA. The additional layer of non-stick coating allows the TeChef cookware to be uniquely designed and decorated using Teflon Print Design technology, an innovative and safe method of applying color and prints without the use of harmful external paints. GOOD INNOVATION - The unique swirled channel design helps oils drain slowly to give food more flavor.